Nick Bradbury achieved his sixth entry in the Merit Table batting charts this summer after cracking 51 in a friendly win for CAMRA against Elton Park last weekend. Bradbury also plays for Orton Park. 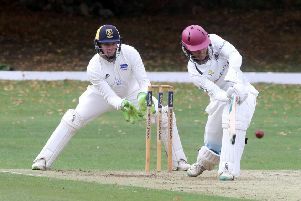 Hampton’s Aussie import Peter Rowe (17) claimed his second ton of the Rutland Division Seven season - and the only one on the local circuit last weekend - in a 149-run win at Long Sutton seconds. Rowe has batted four times at this level and he’s recorded two tons and two half centuries. Fifteen year-old Zak Treeweek took 5-8 as Ketton Development XI bowled Eaton Socon for just 20 in Hunts Division 5A to complete a 212-run win. Veterans Simon Smith (76no) and Rob Vitas (75) had scored best in Ketton’s 232-6. Players scoring 50 or more or taking five wickets or more in a single innings qualify for the merit table. Only one entry per week and results must be published in the Peterborough Telegraph to be included.